Custom fabric is all the rage. From Project Runway to a variety of online sites that offer custom fabric printing services, more and more unique fabrics are being created and used all the time. 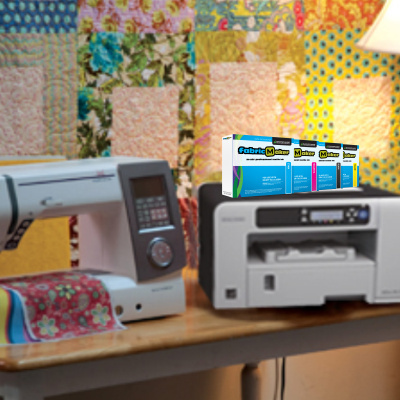 For quilt shop owners and those who sell quilts, the ability to print fabric for customers at will could be a big advantage in the marketplace. The question is, how do you create unique patterns and designs, and how do you help your customers create custom fabric when all they may have is a picture they want to add to a fabric square. The solution is FabricMaker, a custom digital fabric printing system. If you purchase a FabricMaker package, you’ll get all you need to start creating custom fabric, provided you have an iron already. To start creating, you simply need some patterns to print and, luckily, there are resources available which can help you create lovely fabric designs, even if you’re not able to draw a straight line. Here are a few options for finding potential fabric patterns. One resource for potential fabric designs would be a stock photo site. Sites like Shutterstock and iStockPhoto offer royalty free pictures and illustrations that can be downloaded and used for a reasonable cost. Just make sure you check the license agreements on any items you download. Some items will have restrictions on how they can be used. Another source for fabric pattern downloads and ideas would be EZTextiles, a library of digital textile designs that are production ready and royalty free. Artlandia Pattern Central is much the same sort of site. Both offer a variety of patterns which could be used as backgrounds behind photos or simply to create a unique pattern for a label or a quilt block. Another option would be to order software that would let you create your own fabric designs. Software like FabricStudio and Pattern Studio offer you the ability to create your own fabric designs at your own computer. Artlandia Symmetry Mill is another software program that could come in useful for at home (or in store) fabric designers. This program allows you to create repeating fabric designs. If you’re new to printing fabric, or want some assistance in creating patterns, there are also resources available. Many of the fabric software programs offer support when you buy the program. There are also self study courses available from the Pattern Observer. You also should not forget what a great resource YouTube can be. That site offers a number of video tutorials on fabric design.